I received my copy today, and it sadly isn't using slim cases. 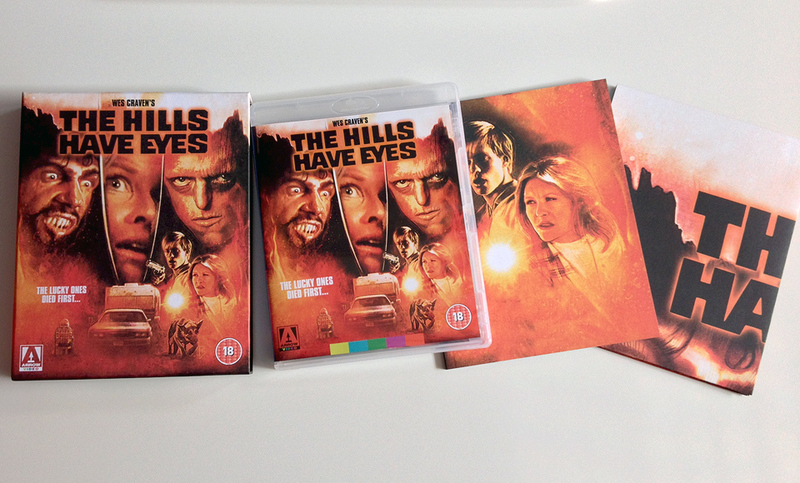 Great to find out today that Arrow opted for the thicker card box for The Hills Have Eyes LE. I assume this is their first for a single-disc/single Amaray title? Must be because they put so much effort into the release (restoring it themselves, crammed with extras etc). Let's hope we'll see more of this kind of packaging (we already know Donnie Darko will get the same). More on the Arrow Video Facebook page if you're interested. The booklet is pretty hefty on this one, which probably contributed to the decision to upgrade the packaging. Glad I didn't cancel mine now (although Zavvi haven't dispatched mine yet)...looks like it'll be a pretty decent collectors item in future! rapta wrote: I assume this is their first for a single-disc/single Amaray title? Is it really ? The picture provided on Arrow's FB feed seems to point towards a 40-pages-ish booklet, which is the same than Deep Red or Blood Bath (both having slim outer cases). I guess the other reason could be people complaining about the fragile nature of the thinner card slipcases? Who knows...but I'm happy they've 'upgraded' the packaging and hope this is something they might consider going forward (assuming it won't push the retail price up too much). Yeah, I would guess it's rather that and the very high profile of the movie. Arrow probably wanted to put every chance on their side to avoid this kind of complaints. Seeing the Ox Bow Incident and The Blue Dahlia in person I actually prefer the original artwork to the newly comminsioned artwork, especially TBD which is one of the classic old film posters. Thanks Arrow for including that option. I am not sure where to post this question. If this is not the right place, please move it. I am looking for empty narrow Blu-ray cases such as Arrow has used for Fassbinder and Woody Allen boxes; however with two-disc capacity instead of the single-disc cases that came with those sets. Any information as to whether such boxes are available and, if so, how to obtain them, will be appreciated. If several suppliers can do this, I would prefer to know of an American supplier. Thank you. 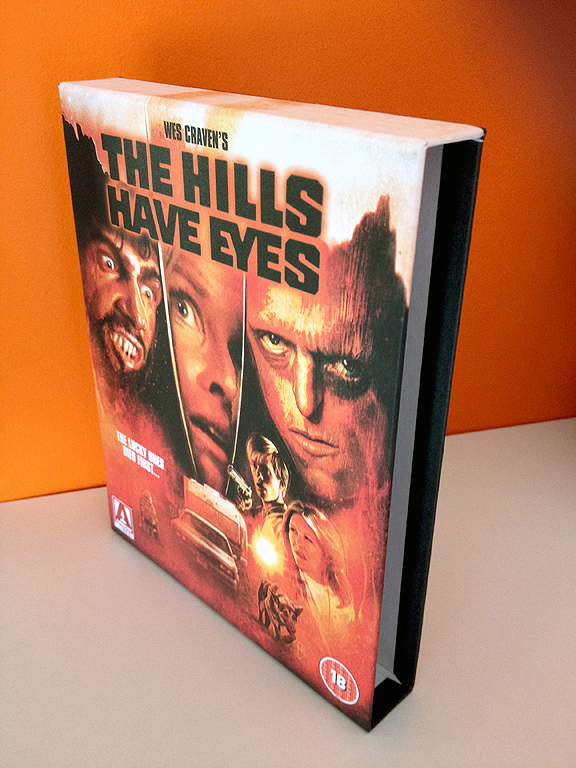 kekid wrote: I am looking for empty narrow Blu-ray cases such as Arrow has used for Fassbinder and Woody Allen boxes; however with two-disc capacity instead of the single-disc cases that came with those sets. So like the Alan Clarke set. And Arrow's DEKALOG, which will use the same cases as the BFI Alan Clarke Blu box. Precisely. So where can I get such boxes? You can get them from Twilight Time website, but their single or double discs replacement cases do not have the logo. I think these are the cases you're looking for, though I think Casetopia has minimums so you may have to buy more than you were planning on. I know some people have copies of the smaller H.G. Lewis box, could any of you post some photos of the box? What A Disgrace wrote: I know some people have copies of the smaller H.G. Lewis box, could any of you post some photos of the box? Dread Central posted some on Thursday. You can't really tell from the photos, but it's actually about the size of a box of cereal. It's huge. I hope those are British boxes of cereal and not American, or I may not have enough space for it on the top of my Arrow shelf. The cases kekid is after are referred to as "11mm spine" cases, so these 12mm ones probably aren't identical – unless they've been misnamed. Whoever supplies these cases to Arrow or the bfi, do they sell the same to people at large (in small quantities)? If so, I would appreciate the info. Alternatively, can Arrow or the bfi sell empty cases to their regular customers? Thanks again for taking time to respond to this question. kekid wrote: Whoever supplies these cases to Arrow or the bfi, do they sell the same to people at large (in small quantities)? If so, I would appreciate the info. Alternatively, can Arrow or the bfi sell empty cases to their regular customers? Thanks again for taking time to respond to this question. Pretty much all Arrow, BFI, MoC releases are made by Sony DADC. As far as I know, Sony DADC do not sell cases to the public. I can confirm however that the cases used in Arrow's DEKALOG are Elite Viva 11mm clear double Blu-ray cases. Hope that's of some use. Is there any place where I can find all the reversible covers of Arrow releases of 2016? MichaelB wrote: Not to my knowledge. I just wanted to see them to take part in that Arrow poll.